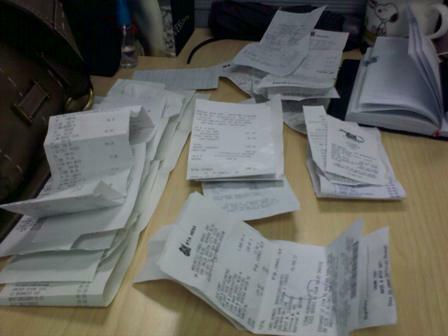 What I personally do is to group the receipts by categories like groceries, clothing, eat out, etc. Then I use Money Manager mobile application to record the total expense per category. I don't record the receipts per transaction date, instead, I do the total per week to make this task less tedious. What I love about this mobile application is that I can record expenses anytime, anywhere! I've been using this tool for 4 years already and this is the simplest mobile financial application I've used so far. In case you want to be on-track with your expenses and get to see how much is left from your payroll every month, then this tool is a must-try! i used to that before, listing every expenses, daily. since we had aquim, i just list major expenses. a budget is just allocated to each category and that's it! hehe makes my life easier!